It was winter 1997 and I was working on the features desk at the Daily Mail. I felt becalmed work-wise and knew that I needed a great story. A scoop, even. But how to find one? I learned from a friend that an old acquaintance of mine was living next door to the son of the infamous spy Kim Philby. I was immediately intrigued. My friend told me that John Philby was a very private person, steering clear of publicity. He’d never given an interview. Smelling a potential coup, I contacted the acquaintance. He advised me to forget the interview: “John won’t do it – he doesn’t trust journalists.” But after some coaxing, he agreed to give Philby a message: would he meet me for a drink? I didn’t realise it, but I had two things in my favour. Firstly, like his father, Philby enjoyed a drink. Secondly, I was female, and – again, like his father – he was partial to the ladies. Some time later he responded: yes to a drink, but that’s all. We met at a seedy wine bar near King’s Cross. John was pleasant, but wary and totally noncommittal. I ordered a bottle of wine and we chatted generally for a while, then got down to business. I endeavoured to convince him (gently) that he ought to let me interview him for the Mail. With the Mail’s deep pockets, I could try to tempt him with money, but instinct told me it would be a mistake. “I won’t insult you by offering money,” I said. “Thank you.” I could see I’d won some brownie points. But I was no closer to an interview. I continued to cajole him, wheeling out every argument I could think of, but to no avail. And every 45 minutes or so I ordered another bottle of wine. By now I was feeling queasy, not to mention pissed, but I matched him drink for drink in case there were more brownie points in that. And that’s how I got my scoop, much lauded by my Derry Street bosses. 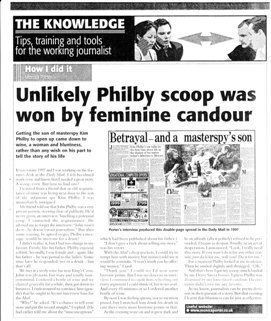 I guess Philby was disarmed by my bare-faced candour. He certainly didn’t owe me any favours. As we know, journalists can be pretty devious in their pursuit of a story. But that evening I learnt that bluntness can be just as effective.